One morning Queen Maeve of Cruachan Ai was lying in bed with her husband and consort, Aillil, and he began to tease her. But Aillil protested that her status had been greatly increased by marrying him: he was, after all, the son of the King of Leinster. Maeve grew angry. She was the daughter of the High King of All Ireland! Moreover, Connaught was traditionally ruled by a Queen, and not a King, and so she held a greater status in Connaught as Queen than Aillil did as her consort. She had wealth in abundance, was famed for her generosity, courted by kings and the sons of kings, and it was Aillil that should be grateful to have married her! Now Aillil’s pride was up, and he insisted that he was the higher ranking of the two, that he was wealthier than she was. Maeve pointed out that he had pursued her, and she had only agreed to marry him because he was as generous as she (she could not be with a man less generous than she was), as brave as she (she could not be married to a man who hid behind her), and had promised to be without jealousy (for Queen Maeve never had a lover without another one waiting outside the door). Their argument turned bitter, and the two of them decided that the only way to settle the matter was to make a tally of all of their possessions, count them all up and see which one of them had the most wealth. So they counted. First they counted gold and silver and bronze, ornaments and rings and precious stones, bracelets and bangles. All was piled up before them, and for every gem of Maeve’s, there was an equal one of Aillil’s. Then they had their clothes counted up: linens and silks and wools, and for every fine cloak of Aillil’s, Maeve had its equal. They counted up the men who owed them loyalty. They counted up the serfs who worked for them, they counted up the grain in the storehouses, and at last they began to count up their livestock. Pigs and sheep and dogs were counted, and there was no single creature owned by Maeve that Aillil had not the equal of. And so at last they turned to the greatest source of their wealth; their cattle. And there, at last, they found a difference. In all things they were equal, every cow and calf, except for one great white-horned bull in Aillil’s herd. Fionnbanach, the white-horned bull of Cruachan Ai, was a magnificent creature, no one had seen the like of him before. And Aillil took great delight in pointing out to Maeve that Fionnbanach had been born to a cow in her herds, but had run away to join Aillil’s herd when he learned that he was owned by a woman. 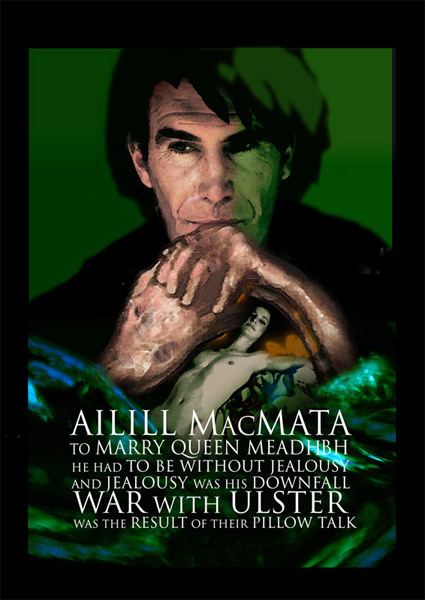 And Maeve had generously given him to Aillil. Now if Aillil considered the matter settled to his advantage, then he did not know his wife. Maeve consulted with her herald, Mac Roth, to know if there was any bull as good as the White-Horned Bull of Cruachan Ai in all of Ireland. Mac Roth was able to tell her that there was a bull even more magnificent in Ulster, in Cooley, owned by a man named Daire. He was called Donn Cualigne, the Brown Bull of Cooley. Mac Roth set out on his journey, taking nine men with him on the road, and when he relayed Maeve’s message to Daire, Daire was only too delighted to agree. The friendship of Maeve and the fabulous price she had offered was more than generous. So he offered the messengers of Connaught a great feast to celebrate. A servant overheard this, and reported to Daire, who was furious at the insult. In the morning, when the messengers asked Daire to show them to the bull, he told them to get out, and go back to their Queen empty-handed. It was only the law of hospitality that kept him from taking revenge on them for their insolence! He told them that if their Queen thought she could take his bull by force, she was welcome to try. He put his faith in his King, Connor Mac Nessa, and Warriors of the Red Branch to protect him from her. When Maeve heard this, she sent messengers out to her six sons (all named Maine), to her loyal friends throughout Ireland, and Aillil send messengers too to all those in Ireland who owed friendship to him, and the great host of the men of Ireland assembled on the plain of Cruachan Ai, and prepared to invade Ulster and take the Donn Cualigne by force.